Entertain your little one with this amusing butterfly crocheted baby rattle! It’s guaranteed to keep your baby happily busy for hours. The crocheted baby rattle also makes for an awesome present for tiny tots for any occasion. In fact, this pattern is perfect for people with intermediate to advanced crochet skills. They will definitely enjoy creating this lovely crocheted butterfly toy. The pattern includes detailed instructions with pictures that will aid you in creating this crochet rattle. This fun crocheted baby rattle is another awesome design by the creative crafters over at Amigurumi Today. 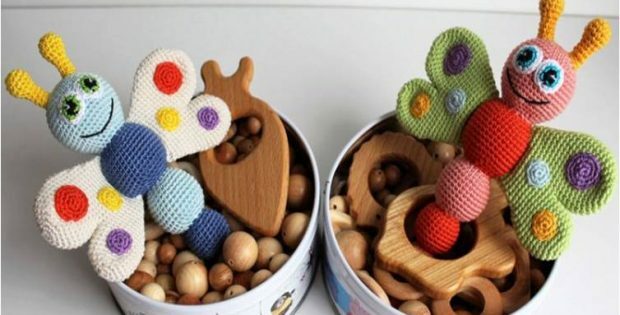 In fact, you can access the FREE pattern for this lovely crocheted toy rattle from their website. Featured image: Amigurumi Today- thank you!